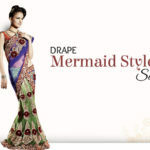 The spotlight moves onto the contemporary style of Saree draping in this video. 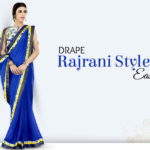 Popularly known as the Indo Western style of wearing a Saree, this drape is an innovative adaptation of the traditional one. Usually worn in printed or color block Sarees. It makes for a great fashion statement and has become a global trend. Take one end of the Saree, make 6-7 pleats and tuck it in the centre facing left. 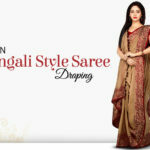 Tuck such that the remaining length of the Saree is to your left and emerges from the inner most pleat. Ensure the Saree length falls just an inch short of the floor. Tuck Saree towards left measuring your span width. You can even tuck the Saree half way around the back. Now, pick the other end of the Saree, make pallu pleats. Bring the pleats from around the back to the front and place it over the left shoulder. Leave the Saree loose so that it makes a deep U on the right side of the waist. Now, pin the pallu pleats neatly on the shoulder. Wear Jeggings instead of petticoat for this contemporary drape style. Always wear your footwear beforehand to get the right length of Saree at the foot. Secure pallu pleats with the help of clamps. Be ready with basic make-up, to save on overall dressing time. Keep trendy Jewelry for accessorizing. 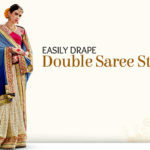 Come, choose from a vast collection of Printed, Chiffon or Georgette Sarees to drape Indo western style.